African houses snakes are small harmless snakes that occur almost everywhere in Africa except in sandy desert. Fourteen species in four genera are presently (2012) recognized. The house snake was known under the scientific name Boaedon fuliginosus in earlier times before it was subsequently renamed Lamprophis fuliginosus. UPDATE (2012): Because I managed to obtain the revision by Kelly et al. (2010) only near the end of 2011 and the CareSheet was penned early in 2011, I now have to adjust a few taxa. It looks as though Lamprophis/Boaedon capensis has been dumped and now runs under Boaedon fuliginosus once more. However, no matter which generic name may be applicable at a time, house snakes will remain house snakes, no matter whether in Africa or in a terrarium! Females grow to about one metre in length and are of a stouter build than males. The latter are typically just half as thick and fully grown at 60-80 cm. The ground colour ranges from dark brown to light brown, with lighter coloured specimens often exhibiting a spotted pattern in the anterior third of the body. A characteristic trait is the presence of a light-coloured stripe on either side of the head. This stripe may also continue almost to the middle of the body in some individuals. 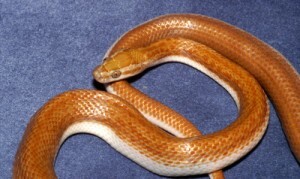 Brown house snakes are nocturnal, but occasionally also seen basking during the day. These are placid snakes that strike only rarely. Handled with calm, they will not try to strike, but exceptions confirm the rule here as well! House snakes feed on mice and are therefore quite easy to care for. The English name refers to their being found very often in the immediate vicinity of, and even in, human habitations. As many people fear snakes, many of them are killed on sight. Those who know them as being harmless appreciate their feeding on mice and tolerate their presence. Fortunately, there are now initiatives in many African regions to educate people on the usefulness of snakes. Teams of tutors travel through their countries and do not only show pictures, but also demonstrate to people that live specimens are nothing to be afraid of. Caring for brown house snakes in a terrarium is fairly straight forward as they do not pose particular demands on humidity levels or temperatures. Their tank should not fall short of 80 x 40 x 40 cm (lxwxh), but larger terraria of maybe 100 x 40 x 50 cm (lxwxh) are of advantage. Although Boaedon fuliginosus are not exactly known for their climbing skills, this does not mean that climbing branches are not required for outfitting a terrarium for them. Every now and then, you will find them roaming the upper reaches of their tanks, as it is here where the lamps above create the warmest area. Temperatures should not decrease below 18-20°C at night and range around 25-28°C during the day. A localized hotspot offering some 35°C under a spotlight is a useful addition. A cork tube and a water bowl complete the outfitting of the terrarium. For reasons of looks and to keep the level of humidity up, a climbing plant (e.g. Philodendron) should be placed in the tank as well. I keep my specimens one by one because there is no particular reproductive season for Boaedon fuliginosus. If left together all the time, there may be several clutches of eggs per year, causing you to soon run out of space for nursery tanks! It does not quite take two months from copulation until a clutch of eggs is laid. It may comprise between 7 and 13 eggs. Placed in an incubator at 25-28°C, fairly substantial hatchlings emerge after some time. They already resemble their parents and measure up to 15 cm in length. This size makes raising them easy in most instances, because they are already able to feed on baby mice. Individuals refusing to feed are rare, but they do occur every now and then. The baby snakes should always be fed individually as they are very voracious. Leaving them to feed in a group without supervision, it may happen that one snake consumes a sibling together with a pink mouse. This is then often labelled as an “accident”, but is in fact a consequence of deficient husbandry practices for the juveniles! Other than that, raising baby house snakes is easy.